Hyundai has unveiled the new i40 saloon which is set to go on sale in the UK this autumn. We've already seen - and been very impressed by - the Hyundai i40 Tourer which was officially unveiled at the Geneva Motor Show. And now the brand has followed that up with the equally attractive four-door saloon. It certainly looks the part and is far more stylish than many traditional saloons in this market. Hyundai said the new i40 saloon was benchmarked against the Volkswagen Passat CC in terms of looks which explains the coupe-like profile. We think it has enough to make it stand out and be distinctive which will help with Hyundai's image in this class. It's last attempt was the dull Sonata. 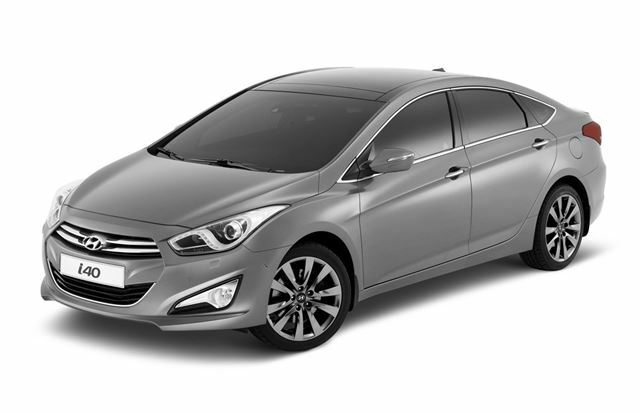 Hyundai has long been known for making cars that were affordable and reliable. And it's now adding stylish with a quality feel to that list. Although it's a pre-production car there's no doubting the high-class feel to the interior which is further step up from the already impressive ix35. Hyundai says the i40 will have class leading front head room, shoulder room and legroom. The boot has a wide opening with a useful 503 litres of space inside - more than other saloons like the Honda Accord or the Citroen C5. Although the more practical Tourer will actually be the bigger seller, the i40 saloon is still an important car for Hyundai, especially as it looks to make a bigger impact with company car drivers. So it's no surprise to see some very efficient engines in the line-up. The best is the 1.7-litre diesel which is available in two outputs of either 115bhp or 136bhp and although the more powerful version is predicted to be the most popular, it's the 115bhp model which is the economy star - it emits just 113g/km of CO2 and can average a claimed 65.7mpg. The 136bhp version isn't far behind though and returns a claimed 62.7mpg with CO2 emissions of 119g/km.These impressive figures are helped by Hyundai's Intelligent Stop & Go (ISG) engine system (that cuts the engine when the car is in stationary traffic), low rolling-resistance tyres and an alternator management system. The petrol line up is made up of a 1.6-litre with 135bhp and a new 2.0-litre unit with 177bhp.The latter is the quickest i40 in terms of 0-62mph times, taking 9.7 seconds but still returns a healthy 41.5mpg according to the claimed figures. The standard gearbox is a six-speed manual while a six-speed automatic is available on the 2.0-litre petrol and the 1.7-litre diesel with 136bhp. Prices will be announced on 1 June 2011 but Hyundai is hinting that the i40 will cost between 3% and 5% less than similar cars in the class. It will also come well equipped, making it good value for money. High-tech features include smart-parking assist, a lane departure warning system, Bluetooth with voice recognition and full map satellite navigation with a rear view camera. The i40 will also be available with an electric parking brake, heated and reclining rear seats and even a heated steering wheel. Front Fully independent subframe-mounted MacPherson struts, with coil springs andgas- filled shock absorbers. Anti-roll stabiliser bar.